Designing for hydraulic balance and efficiency is critical for any watershape, but nowhere is it more important than with inground concrete spas. Indeed, laying out these projects offers plumbers an unmatched level of complexity – and an outcome that will be permanently enshrined in concrete. You can knock the challenge down to size, says hydraulics expert Steve Gutai, by paying close attention to the fundamentals. Of all the features associated with inground swimming pools, attached spas almost certainly have the most complex designs. Achieving proper hydrotherapy-jet action requires the interweaving of air lines, water lines, fittings, jets and associated pumps, blowers and motors in a way that delivers results the customer wants and expects. And making mistakes is definitely costly: Once the plumbing is set in concrete, there’s no easy way of turning back. The bottom line: You have to get it right the first time! Yes, you can adjust inground systems, but it usually involves ripping out expanses of decking and chunks of the spa shell at the very least – definitely not activities that breed customer satisfaction. It’s a high-stakes game, but all too often I see pool builders take an ill-advised roll of the dice by not doing the work ahead of time to make sure the spa jets receive proper flow and that the overall spa system has a smart layout. 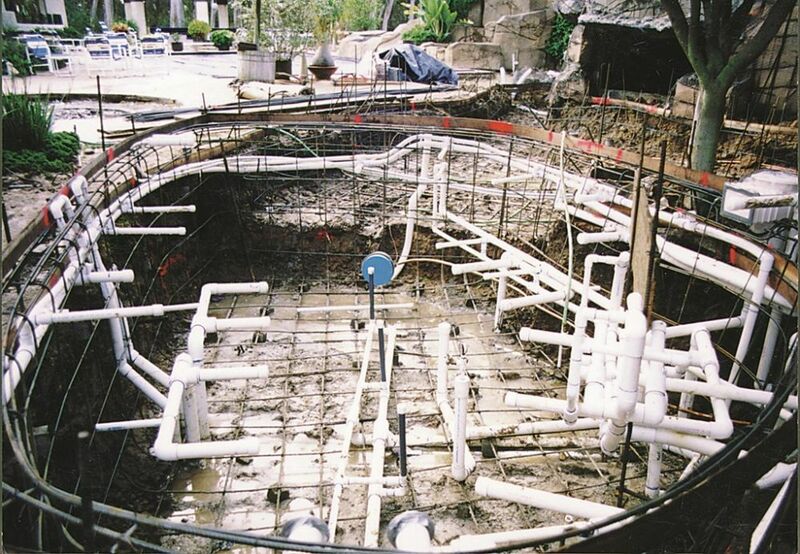 Fortunately, achieving proper system configurations before the shotcrete truck rolls up isn’t that hard to do so long as you follow basic principles of hydraulic design and follow it up with sound installation practices. As with any circulation system, your goal in engineering an inground spa is to balance the plumbing and pump size as a system. What this means is that there’s no way around the fundamentals of hydraulic design: You must do the calculations for pool volume (in gallons), friction loss (feet of head), flow rate (gallons per minute), turnover rate (gallons per hour) and water velocity (feet per second) – because all are essential to proper sizing of pumps and pipes and selection of appropriate jets for your spas. Because this information is widely available through seminars, trade publications and technical manuals distributed by manufacturers of swimming pool components, we won’t get into a step-by-step hydraulics primer here. I will plainly state, however, that if you’re designing spas as part of your projects, you absolutely need to understand basic hydraulics to be successful – or have ready access to designers, engineers and plumbers with the necessary expertise. There’s simply no way around it! Unfortunately, pool builders are the common subject of horror stories on this topic – to the point where the whole construction industry is suspect. There’s no doubt that many contractors know what they’re doing, but it’s also true that some have gotten into trouble by taking shortcuts around the need to do the basic calculations. Figure 1: Casual acquaintance with pump performance curves and a spa jet’s flow requirements simply isn’t enough: You have to understand what they mean in terms of the entire hydrotherapy system for your design to succeed. It is absolutely critical for someone involved with an inground spa project to understand the correlation between flow and velocity and between resistance and pressure at the jet orifice. Step One in designing and installing any hydraulic system – and especially one with the added complexities of a hydrotherapy system – is to align components in such a way that these hydraulic characteristics are in balance. One particularly risky shortcut is the common practice of following the “quarter horsepower per jet” mentality when it comes to spas. This error tends to lead to radical oversizing of pumps used to power spas – and a host of other problems as well. 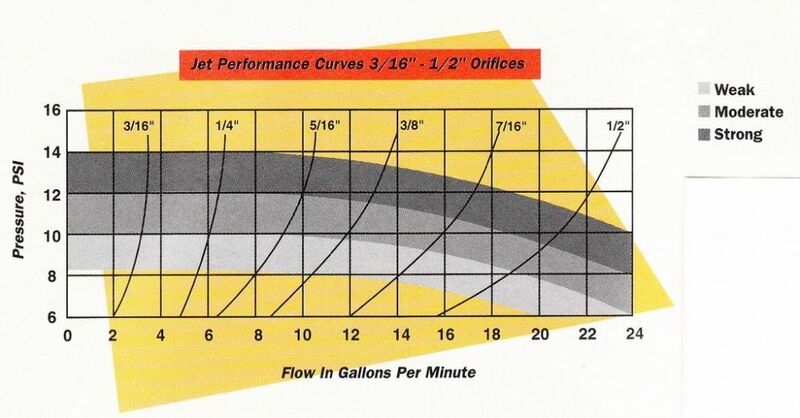 In place of this sort of uninformed folly, designers and contractors need to understand pump performance curves and a spa jet’s flow requirements, which can range anywhere from 5 to 25 gpm for typical spa jets (Figure 1, above) and up to 150 gpm for swim jets. When you look at pump performance specs across a range of pipe sizes and friction loss figures, you’ll find that sizing by horsepower isn’t the way to go: System performance is the key, not muscle. And if you have the candor to admit you don’t know what you’re doing, by all means find someone who does. Ask your vendors for technical support and remember that even the cost of hiring a consultant will be less in the long run than having to pull out a deck, break a shell and make good on inadequate work. There are many reasons why getting the hydraulics right is so important with spas in particular. Proper pipe sizing and pump selection, for example, result in proper flow at the jets – all-important because the air system will not work properly if either too much or too little water is moving past its apertures. And in fact, most of the calls I get from panicked builders are either about not enough air or not enough water coming out of the jets. Sizing pumps by horsepower, undersizing pipes as a cost-cutting measure, or failing to follow a few basic rules (such as using a combination loop and manifold for water lines or a Hartford loop for air lines – the need for both of which we’ll cover below) are among the most common mistakes made. In teaching builders and plumbers how to get it right, I break spas into three systems: suction, discharge and air. 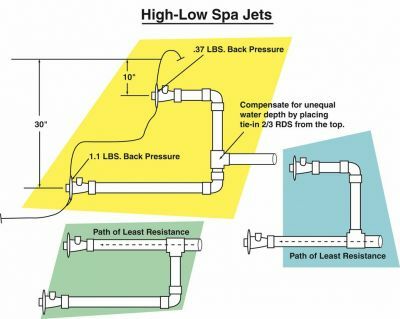 Figure 2: This eight-jet configuration around a ten-foot spa is fairly typical among spas attached to pools. This familiarity, however, shouldn’t lull you into taking jet-system configurations for granted. There are many ways to approach each topic, but I know from experience that this approach works consistently and well. As an example, let’s assume we’re plumbing a spa with eight jets, all at the same depth and each with a 5/16-inch orifice requiring a flow of 10 gpm, giving you a total return flow of 80 gpm. 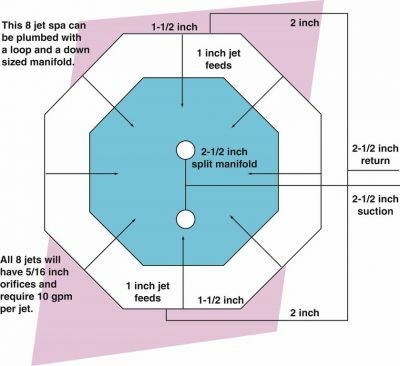 The jets are spread symmetrically around a 10-foot octagonal spa (see Figure 2) – a fairly standard configuration for a concrete spa attached to a pool. All too often, plans for this sort of installation will say no more than “run eight jets off 2-inch suction/2-inch discharge/2-hp pump,” leaving it to the plumber to decide what to do in the absence of more detailed instructions. If he or she knows what’s what with spa hydraulics, the builder and customer are in luck. If not, the project’s involved in the ol’ crap shoot. Many builders get into hydraulic trouble when they install spa jets at different levels in their concrete spas. Once burned, they tend foerevermore to position all of their jets at one level – certainly a workable solution, but hardly one that allows for much creativity in spa design. Understanding why these problems develop with multi-level jets can help overcome this phobia and ensure proper jet performance. The trouble here extends from the pressure differential provided by the added weight of the water on the lower jet. This creates uneven flow at the orifices, and, depending on how the system is plumbed, you’ll end up with terrible performance out of the lower jet, the higher jet or both jets. The answer here is simple, but first you have to understand the mistake. What I usually find is that things have been arranged so that the return line feeds either the top or bottom jet and the other jet is branched off the first. Because water will naturally follow the path of least resistance, the jet nearer the feed will have greater flow than will the other jet – especially if the feed goes directly into the upper jet. As shown in the illustration, the key is to compensate for the pressure differential by offsetting the feed line between the two jets, connecting the feed line about two-thirds of the way down from the upper jet. This gives the water flowing to the lower jet a bit less resistance, thus evening out the flow between the two orifices. [ ] Suction lines are pretty straightforward, so long as you observe some simple guidelines. I’m not alone in recommending a split manifold line at a total maximum velocity of six feet per second. (For safety reasons, no single suction line should have a flow velocity of more than 1-1/2 fps.) In our sample spa, I would plumb a 2-1/2-inch suction line branching off a 2-1/2-inch manifold for the drain lines. [ ] Return lines are a bit more complex, given that we’re plumbing for multiple jets. 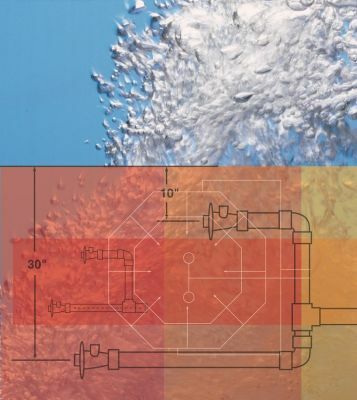 I recommend designing for a velocity of 6 fps: This velocity, in combination with recommended pipe sizes, is efficient and puts you in the necessary range of water flow and pressure for a good many of the jets available to you and your customers. The return system should begin with a 2-1/2-inch line feeding a 2-inch split manifold plumbed to opposite sides of the spa (again, see Figure 2). The manifold would in turn feed a plumbing loop of 1-1/2-inch pipes that feed all eight jets. 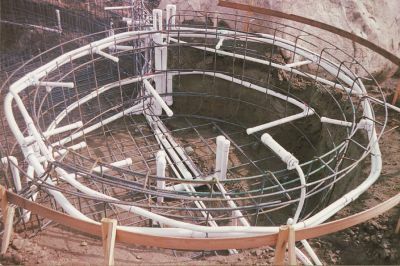 This split-manifold, one-level, plumbing-loop arrangement provides an extremely balanced flow at all jets – and ample opportunity to incrementally decrease the plumbing size while avoiding a sudden decrease that would apply unnecessary resistance and ultimately decrease water pressure at the jets. Let me emphasize: This step-by-step reduction of pipe size is important. Note that this layout includes several plumbing tees at which we come out of the tee with a pipe size smaller than the feeding line, dropping from 2-1/2 inches to 2 inches using a 2-1/2-inch tee, with 2-inch plumbing coming out of the fitting. This approach minimizes friction loss and maintains efficiency, where running the 2-1/2-inch feed line into a 2-inch tee would throw the system out of balance. Another common misconception is that you want to use a high head pump on a spa-jet manifold. In fact, the exact opposite is true: A properly designed system such as the one outlined in the example should be run by a medium-head pump. When you design the system so that the jets have proper flow and pressure – and the plumbing is laid out in an efficient and balanced way – you can use a medium-head pump. The result is a system that is energy efficient and almost certainly more effective in creating proper jet action. If, however, the pump also provides circulation for the pool filter, you will want to use a high-head pump. Whenever possible, however, I recommend separating pool circulation from spa circulation through use of separate pumps. [ ] Air lines are really very simple to install – but they can be a bit hard to understand. We’ve all heard the term Venturi, of course, and most of us know that this refers to the phenomenon of (and components designed for) drawing air into a fluid stream. At its most basic level, the “Venturi effect” means that water flowing past an opening in a pipe will draw in a certain amount of air. This is, of course, a gross oversimplification, but it again speaks to the need to have proper water flow and velocity in the plumbing lines so that the Venturi will work properly. The amount of air a jet will draft is measured by inches in a water column (WC) and indicates how much the Venturi will draft. All jets create a certain amount of vacuum in the Venturi chamber that can be expressed in WC units. This will correlate mathematically to a jet’s pressure rating, orifice size and flow requirements. AS A SPA’S OVERALL DESIGN becomes more complicated, the need for a clear, accurate plumbing plan is obvious. Leaving it to the plumber to sort things out is risky business in cases like these, no matter how accustomed he or she might be to basic spa layout. Photos courtesy Barnes Watertech, Encinitas, Calif.
Jet designers take care of the engineering that makes their products function properly; your role is to see that they are plumbed correctly and are provided with an adequate flow and pressure. Helpfully, if you’re installing the jets on a properly balanced hydraulic system, getting the air lines right isn’t too difficult. Air lines of specified dimensions connect directly to the Venturi. One of the keys to air-line performance is a properly installed Hartford loop, which is really little more than a section of pipe that reaches above the water line, ideally close to the jets – that is, within the bond beam. This loop should be installed in the manifold right before its splits into the air lines. Without such a loop, water will fill the air line when the system is off. The Hartford loop places an air gap in the line – crucial for starting the Venturi effect when the system is turned on. The loop also provides some vertical pressure due to the weight of the water in lines; this pressure helps evacuate water from the lines. The loop should be installed near the Venturi. Here, it will only need to break the water line by two or three inches to be effective. If all of this is a bit confusing, don’t worry. What’s important to know is that when you install a Hartford loop, the entire system becomes far more forgiving: You can be a bit off in terms of flow and pressure, for example, and still have adequate jet action. In fact, I’ll go as far to say that in a great many situations the difference between a system that works and one that doesn’t boils down to whether or not it has a Hartford loop. The last step in successful inground-spa design and installation is making certain the jets you’ve carefully selected are configured correctly. When used as specified, spa jets will operate beautifully – but there are a couple of key considerations. Depending on their design, the jets themselves may be installed several inches behind the surface of spa wall. The jet then extends to an eyeball or perhaps a rotating assembly mounted at the wall’s surface. IT ALWAYS PAYS to mind the fundamentals when plumbing a spa’s hydrotherapy system, even when you’re working with a simple round spa. Remember: The outcome of your efforts will be compared to what bathers have experienced in finely engineered portable spas – and whatever you do will be encased in concrete! Mismatches between nozzles and eyeballs can spell trouble. In fact, I’ve seen many spas that didn’t work properly simply because an eyeball of the wrong size (usually too small) has been installed. Too small a nozzle will restrict the flow of both air and water and add resistance to the system; too large a nozzle will dissipate the flow through the nozzle and probably hamper performance. The fix here is simple: It only makes sense to pair the correct eyeball with the jet right from the start. 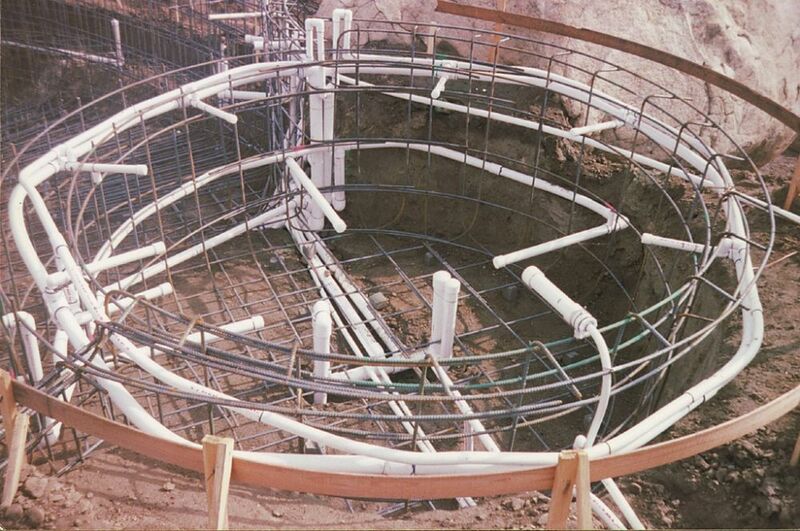 In some cases, the thickness of the shotcrete in a spa wall is a source of concern. If it turns out to be thicker than expected, inadequate jet action may result from the increase in distance between the Venturi portion of the jet and the nozzle. Again, the remedy is simple: All you need to do is use a simple nozzle-extension kit. Here and in many other stages of developing a good spa system, the steps to follow in getting things right are usually pretty simple. To get to this point where things can come together with relative ease, however, takes a good grounding in basic hydraulics, a good (and detailed!) plumbing plan and a plumber who has a sense of the importance of getting things right. The proof of the pudding will be in the action at the jets: If yours are to meet the expectations created for your customers by the engineers at portable spa manufacturers, you need to focus on the basics, do the calculations, avoid casual solutions – and, if needed, call for help before you seal your work in concrete! I would like to know what test are used to find out if a pre existing pool ins hydraulically balanced. i am working with a contractor that states a "Water and Air Test" can prove that the pool drains are hydraulically balance. Is that true. The only test that can be done after the pool construction is complete is a vacuum and pressure measurement a the pun volute. Plug a vacuum and pressure gauges in the suction and pressure side of the pump. Multiply the vacuum by 1.13 and the pressure by 2.31 then add both numbers to get total system tdh. To get the delta pressure at the drains you will need to measure each independently and do the math.